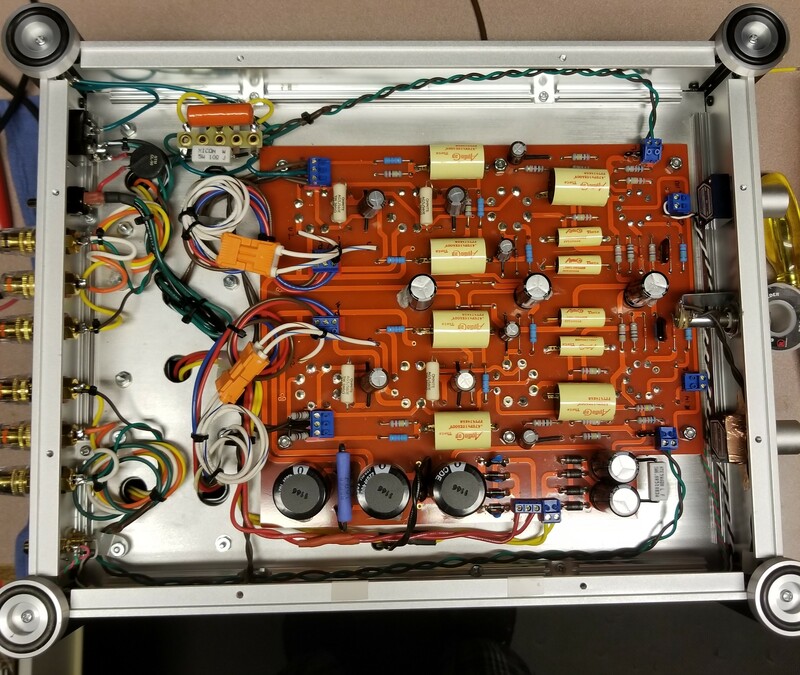 This is a clone of a Audionote 6v6 Kit 4 stereo amplifier. I have wanted to build this circuit for about 5 years. 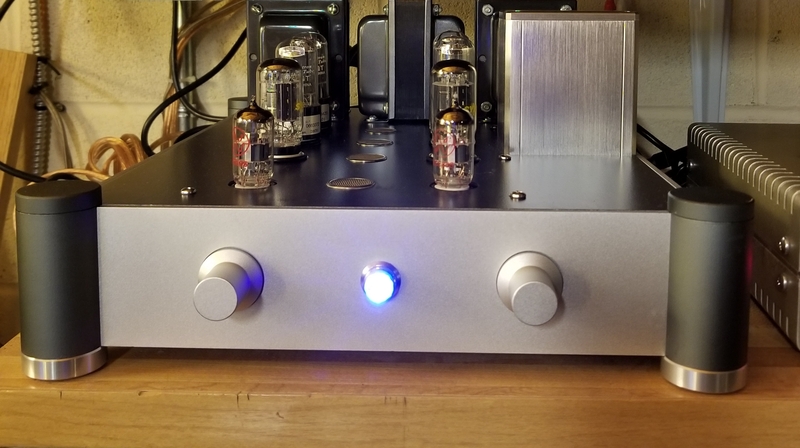 It is a vast improvement over the Dynaco 6v6 clone that I had built some years ago. The tube complement is two 12AX7, two 6SN7, and four 6V6. 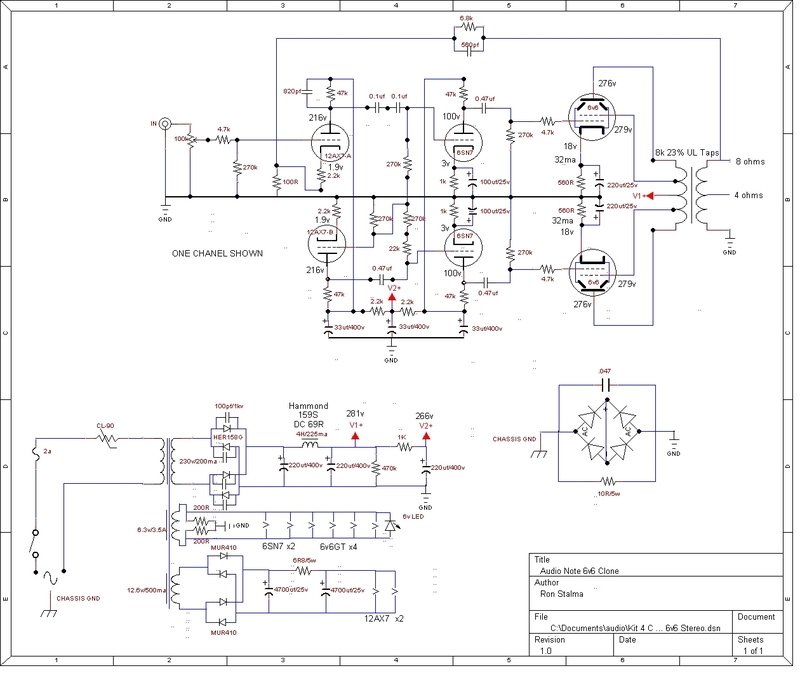 Amplifier Schematic. The circuit is practically identical to the original with a few changes, but of course a different PCB layout. As of yet I haven't taken any measurements as I have not yet fine tuned the feedback circuit. The component values used in the feedback circuit were chosen for the original output transformers which are unobtainium at this point. Also the ordinal circuit did not use ultralinear transformers. The board is of a similar size to the original. Audio Cap PPT Theta's are use throughout for coupling capacitors. The electrolytic caps directly in the signal path are Elna Audio SILMIC II. Power Supply capacitors are Cornell Dubilier SLP. 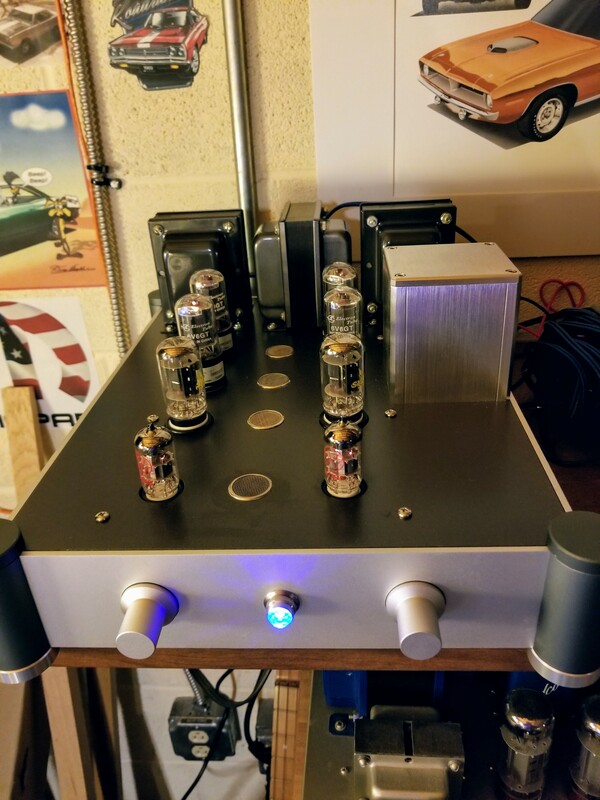 Cathode resistors on the output tubes are Ohmite Audio Gold series. Unlike the original this board is easily removed if necessary. I used plug in screw terminal block connectors for easy disconnection. Also you will notice the orange/white plug in connectors. Those are standard power connectors used in lighting ballast connections. They are available at your local electrical supply store or Lowes and rated up to 600 volts. I used those on the ultralinear screen taps since the screw terminal block connectors would not work for that situation. I wanted to use something different other than a standard Hammond or Bud chassis. This one came from China and for some reason it is built like a tank! 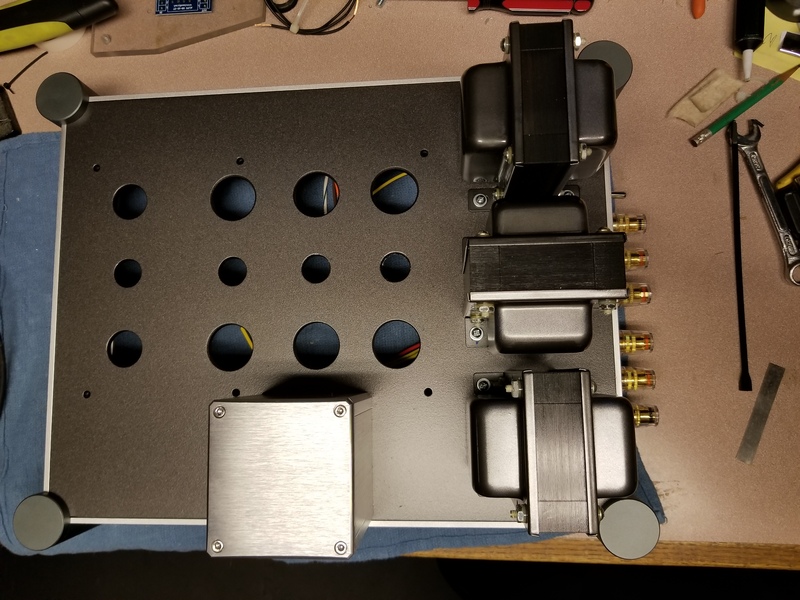 The top chassis plate is around a 1/4" thick. It was a real bugger getting the holes in it. I had to use carbide tipped hole saws then finished with a step drill bit. The silver transformer cover houses a Hammond 159S 4hy 225ma power supply choke. The output transformers are oversized compared to what you would find for a 6V6 scenario weighing in at 4.5 lbs each. The UL taps are wound at 23%. Why? - David Hafler and Herbert Keroes did extensive research to determine the optimal set-point for ultralinear transformers for various vacuum tubes and according to their research the optimal for a pair of 6V6 is 23%. The vacuum tubes are JJ ECC83S, NOS Sylvaina 6SN7GTB, and interestingly enough I tried some of the Chinese Apex matched 6V6GT's from Antique Electronic Supply which actually sound nice!